The Block Facilitator Mr Anowar Hussain under the Community Action for Health programme motivated the members of the village health sanitation and nutrition committee (VHSNC) to meet every month to discuss the health issues and take concrete actions on the issues pertaining to their village such as need of clean surroundings in their village. Village ASHA, Pranita Kalita; anganwadi workers, Nabami Baishya and Golapi Khaond; ANM, Renuka Begum; and the PRI member, Nilima Pathak are the active members of the VHSNC and they regularly attend its meetings. In one such meeting held in June 2016, they decided to organize a ‘Safai Abhiyan’ in their village. The VHSNC members motivated the community including youth, women and children, to volunteer the cleanliness drive. 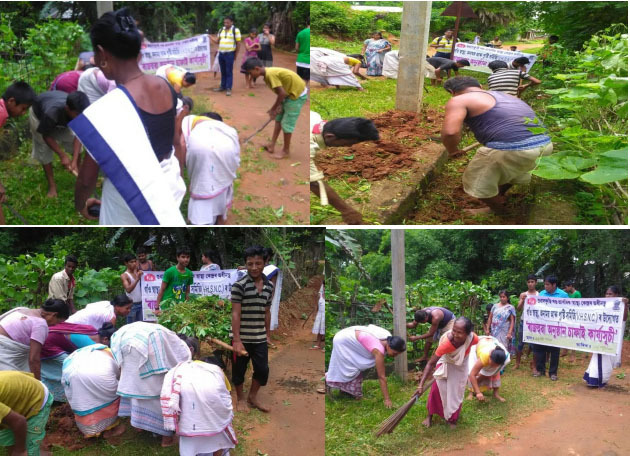 On July 01, 2016, they cleaned the premises of Sivathan (Mandir), the play ground of the school and the drains on the central road of the village. In addition, the VHSNC members have participated in the ongoing Intensified Diarrhoea Control Fortnight, special awareness drive on Japanese Encephalitis and Family Planning, organized by the State Health Mission across Assam during July 2016.